Cosplayers. In the whole of geek culture, we either know them or are them. Creativity abounds in cosplay, just like it does in all other mediums, and it has become a passion for many people the world over. For two PCU contributors, however, Baltimore Comic-Con 2017 was their first time unveiling an official cosplay. It was time for them to put themselves out there, and embrace the call to dress up like some of their favorite characters, and walk the floor at one of the Washington DC Metro area’ premiere conventions for everything comic books. These are their stories. Last weekend was Baltimore Comic Con, and while it wasn’t my first convention by any means, it was the first time I took the time to don a costume – a real one that I ended up making mostly with my own hands – and cosplay for almost the entire day on the Saturday of the show. I’m a veteran of conventions. I’ve attended them regularly as a fan for about fifteen years and as a comic creator for nearly 6 years. But cosplay is an entirely new creature…well, sort of. Back in 2012, my wife and I attended Baltimore Comic Con and decided to dress up on one of the days as Hawkeye and Black Widow from the movie version of Marvel’s The Avengers. Aside from Hawkeye’s quiver, which I made out of cardboard, foam and paint, everything I wore was store bought and was very basic. The combat boots I wore that day didn’t make it easy to want to stay in costume long and about 3 hours after entering the show floor we headed back to the hotel to change back into “civvies” to go back to the con. It was a fun experience, albeit a brief one. We were stopped a few times for photos but not in a way that prevented me from enjoying the show itself. We enjoyed it enough that a year later we decided to cosplay again in Baltimore – this time as Clint Barton “Hawkeye” and Kate Bishop “Hawkeye” from the brilliant Matt Fraction/David Aja run of the comic series. That costume was even more basic. Nothing but jeans and a purple t-shirt and a bunch of Band-Aids and bandages. I went with smaller “toy” version of the bow that time around, a small quiver with a few arrows, and carried around a small coffee pot as a prop. Without Nicole’s Kate Bishop (and her tiny Pizza Dog toy) it was difficult for people to realize who I was. One guy thought I was Marv from Sin City. Again, it was fun, but nothing prohibitive of enjoying the show and nothing that made more than a handful of folks ask for a photo. 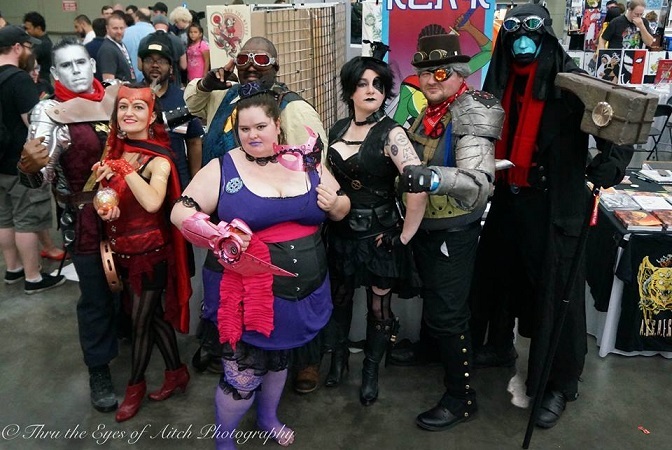 So this year, when Nicole said to me that she wanted to do a Steampunk version of the Scarlet Witch for a cosplay, it started a snowball effect of creativity with our friends and ended up with a group of us saying we’d all cosplay as steampunk Marvel characters. Courtney was in for Domino. Husband and wife pals Jared and Justine were going to be Cyclops and Psylocke. James was going for Cable, and Tim was going to alter his already amazing Ronan the Accuser with a steampunk twist. My choice was difficult. I wanted to “match” my wife, but we had already done MCU versions of Scarlet Witch and Quicksilver for Halloween 2015. And with my body type I felt more like Nestle Quik-silver than Pietro Maximoff. If I was going to do this right I had to pick someone barrel-chested. Someone who a guy that’s a shade over 5’8” and tipping 250 lbs could do well…and there was one choice that jumped out at me: I had to go as Colossus. The costume took me a few months to design an ultimately put together. I started out by buying a shiny silver bodysuit that looked like it was made of chrome. I researched the best silver makeup and found a great theater quality powder and liquid mixture. For the clothes it was important to me to not only go with the steampunk look but also to make it look like the outfit was something a Russian strongman would wear, so I went with a pair of gray dress pants with a subtle black pinstripe and tucked them into a pair of combat boots. For the torso, I didn’t want to cover too much of the arms since that would help nail Colossus’ look. I had an old tunic that I used to wear during my PA Renaissance Faire days and figured I could get another use out of it. I used a fabric paint marker to add stripes to the arms of the silver bodysuit and realized I would still need to cover my exposed hands. I knew that a pair of brown leather gloves and black leather bracers would really add to the Steampunk look. A red scarf around my neck like an ascot tucked into the tunic was not only perfectly Russian but also completely steampunk. I just needed something else…something to help bulk me up. I read tutorials about foam armor and how people would get anti-fatigue mats and use heat-guns and super glue to form them into lightweight armor. I also had the idea of getting either lacrosse or hockey pads to bulk up my shoulders and give more mass to Colossus. I found a pair of kids’ shin guards at a thrift store and tore them apart before rebuilding them into coverings for my shoulders and biceps. I cut some foam and shaped it, attached it in the front and back to the former shin guards and made it into a set of shoulder pads. A quick coat of black PlastiDip and a half-dozen coats of various metallic silver, bronze and gold paint later and it was nearly complete. I then added some black and gold ribbon on the tunic in the shape of an “X”. Speaking of that X, I also realized I needed a belt, so I made one from an old brown leather costume belt and took some more foam to make that iconic X-Men belt buckle but with a steampunk flair. I added a pair of steampunk goggles to the belt for good measure and put a bunch of gears on the shoulder pads and to the tunic – and at that point the costume was 99% complete. It just needed one final touch. I looked up how to write “Mother Russia” in Russian and put “мать” on one shoulder and “России” on the other. There it was complete. All I needed to do was wear it all on the Saturday of the show. Meanwhile, my wife was absolutely nailing it on her version of the Scarlet Witch. Her whole costume was amazing and I was just trying to keep up. We were energizing one another with excitement. On Saturday morning, just after waking up at the hotel and having some breakfast, I started to apply the silver make-up. Up until then I only tested it on a small part of my hand and on a tiny spot on my cheek. This time around I was going to be doing my whole head and neck. And it went on perfectly. The whole thing only took about 25 minutes, and that included time my wife spent helping to make sure I got inside my ears and behind my neck pretty good. The costume took about 10 minutes to put on and wasn’t nearly as warm as I worried it would be. When Jared and Justine came up to our room before the convention their reaction was what I was looking for. They looked great. Nicole looked great. And I felt that I did a really good job on the costume. I couldn’t wait to get to the con and see the rest of the group. Crossing Pratt Street from the hotel to the con was awesome. People were stopping us and commenting. On the way inside people were already stopping us for photos. Once on the show floor we had to have been stopped a dozen times in the first 20 minutes to pictures. Nicole and I planned to get scanned for a 3D model of ourselves from one of the booths in the con, a gift to each other for our upcoming 12th Anniversary. Once the scan was complete and our order was placed, we met up with the rest of the crew and over the next six hours walked the show floor like rock stars. I don’t think I had as much fun at a comic convention as I did that day. It was a completely different experience than what I’ve been used to. Whether it was behind the table as a vendor or in front of the table as a fan, I’ve always enjoyed myself. But this was a different kind of enjoyment and made me realize I want to do more of it. I’m hooked. I have other cosplay outfits I’m working on now. Jon Snow. Negan. Dustin from Stranger Things. I want to create a Marcus Fenix/Gears of War set of Cog armor. Now my imagination is going wild and cosplay has me in its grip. It’s just a matter now of getting the costumes completed and figuring out when I could wear them. No matter what your opinion is on cosplay, you really will never know what to expect until you try it. And you never know…it just may become your next new hobby. Just like mine. Baltimore Comic-Con 2017 was not only my first BCC, but my first official cosplay as well. I’ve been to other conventions (I went to the very first Awesome Con dressed as my character from a film I was promoting), but never just cosplayed because I could. I knew that a lot of my cosplayer friends spent a lot of time on their cosplays, but being that this was my first time, and I didn’t have a lot of time or money to plan, I decided to work with what I had on hand. With my lack of time, money, and (admittedly) forethought for this year, this was definitely going to be a “closet cosplay”. I had recently shaved my head for the first time about a month or so ago, so about a week before the con, I decided that I wanted to go as the well-known leader of the X-Men, Professor Charles Xavier. Now, I’ve got a myriad of clothes to choose from, as I used to work in menswear, and I know what looks good on me. However, I wasn’t dressing for me… I was dressing in an attempt to emulate a character I love, and that’s a bit more difficult. However, I was glad that I had a suit that sort of fit. Based on color schemes I knew would work for me, I decided to go with “New Avengers: Illuminati” Professor X, as drawn by the brilliantly talented Jim Cheung. I got up in the morning (quite early, as I live about 90 minutes from Baltimore on a good day), showered, shaved my face, and then proceeded to “bic” my head to get that smooth-domed look (I’m allergic to most latex, so a store-bought bald cap was out of the question). I donned my shirt, tie, and suit, and ensured that I had the right color scheme going. New Avengers: Illuminati Xavier wears a dark suit, white shirt, and blue tie, so that was going to be my best option. I double-checked my look in the mirror, practiced a few poses and looks, and made sure that I was comfortable with everything. Upon arriving at the convention, I was pleased to see so many of the great reactions I got from the other attendees. As I meandered around the show floor, I kept getting stopped for photos, and I would frequently hear gleeful exclamations from young kids saying things like, “Look dad! It’s Professor X!” I love making kids smile, so that was a huge bonus for me. I also got a chance to pose for pics with Marc (as you see above), and a couple other friends who cosplayed amazingly. All of that being said, I did get a little warm after being there for several hours, as it was 86°F / 30°C that day and I was in a wool suit. I must’ve pounded about 2 liters of water throughout the day. Since I was scheduled to speak that day (Saturday) on the topic of diversity in popular culture – specifically focusing on disability, I felt that going as a character with a disability was completely appropriate; especially since I am a wheelchair user myself. I have always been an advocate (and a general loudmouth) for the rights of people with disabilities, and since Xavier’s look is subtle as cosplays go, I figured that this would help me get my points across. As this one was a closet cosplay, there wasn’t much to the creation process for me. However, I plan on working with one of my good friends (who is a brilliant fabricator & member of the 501st Legion) on more ideas for the next time I bust out this cosplay. We talked about building some X-shaped “spokes” for my wheels, and even discussed different ways to create Xavier’s yellow hover chair. As I am not well-versed in fabrication and/or costume creation, I’m glad that I have good friends whom I can call on when I have an idea that I want to execute. This is not to say that I plan on pigeonholing myself into only cosplaying as Professor Xavier. Far from that, in fact. With the help of my friends, YouTube, and some patience & hard work on my part, I would love to branch out into other characters I’ve loved over the years. I’ve thought about taking on the challenge of cosplaying Solid Snake (Metal Gear), a Minion (Despicable Me), a Dalek (Doctor Who), and a few others. The success of my first official convention cosplay has got the creative juices flowing, and I have a lot of ideas that I want to attempt. I thought I would take my last bit of space here to share some thoughts on things that I learned about cosplay with any people here who have disabilities and have ever thought about trying it. First, figure out what characters resonate with you. Those characters & personalities with whom you can identify are going to be the most successful for you. It also helps if you can learn some of the poses and iconic imagery of the character, as you’re going to get stopped for photos. Second, take some time to research all of the different versions of the character you want to cosplay. Especially in comic books (DC & Marvel, mostly), there are going to be different versions of our favorite characters, with different looks, and drawn by different artists. You’re bound to find one that you like more than the others. Third, if you’re doing a closet cosplay, make sure that you check the fit of everything in advance. Don’t make the same mistake I did and wear something that almost fits for several hours on a hot day. Finally, in the words of Nike and Shia Lebouf, JUST DO IT. Get out there and try something. It doesn’t have to be super accurate (especially if you’re typically broke like me), it doesn’t have to be something grandiose, and it doesn’t have to be something terribly well-known. You also don’t have to go out and spend hundreds of dollars on materials, equipment, and fabric in order to cosplay. Just do what feels right. Most importantly, it doesn’t have to be a character with a disability! Cosplay as whomever you want, and don’t let anyone tell you otherwise. Remember: cosplay is for everyone!